It was when the road turned into a track, and the track turned into a fire-trail, that I started wondering whether this was a good idea. 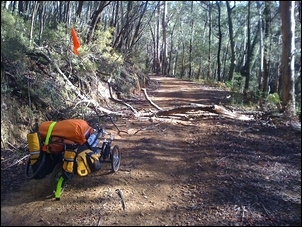 I was on my recumbent suspension pedal trike, complete with a 38kg load of water, camping gear and food. Add my weight of 90kg and my trike was carrying 128kg – over five times the weight of the machine itself. I’d intended heading south from my home town of Bungendore in New South Wales along the reasonably good dirt roads I’d previously driven in a car - but a major bushfire put a stop to those plans. So instead here I was traversing the Mulloon Fire Trail through the Tallaganda National Park, crossing the Great Dividing Range. This was primarily a test of the suspension system of the trike. Since Part 7 in this series (see Chalky, Part 7), I’ve changed jobs, moved interstate – and been confronted with a whole new test environment. Local roads had already shown the need to add front dampers; I'd used modified Yamaha R1 steering dampers of the type already fitted to the rear suspension. The fire trail went on and on, climbing over rough terrain. The track itself was probably impassable in a conventional car – although in a four-wheel drive with good ground clearance, it would’ve been fine. Kilometre after kilometre, the trike suspension was working immensely hard, coping with washaways, rocks as big as my fist, steep ascents and equally steep descents. It was probably only about 15 kilometres of really rough stuff, but when I left the trail and returned to a reasonably smooth dirt road, I took stock. I was physically tired – very tired – but I’d survived. I’d not got a puncture (the suspension massively saves the tyres) and the frame was unbroken. The suspension airbags had worked impeccably. 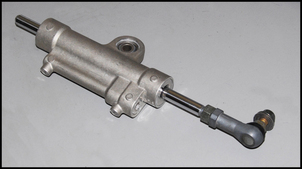 Clearly, the damper seals – designed for the relatively slow movements of handlebar inputs on a motorcycle – couldn’t handle the pressures of very quick suspension deflections. Well, not the ones caused by this trail, anyway. It was time to completely reinvestigate damping. The trouble with solutions is that often they appear easy – until you look further. ...or build my own dampers (sounds great until you start thinking about the real-world practicalities of making hard chrome-plated shafts, sliding seals, etc). Instead, I decided to try to incorporate the damping system into the springing system itself. If successful, this approach had the potential to improve packaging, save weight over running the three external dampers, and give better control. So how could this be achieved? The Firestone rolling lip airbags can be filled with water, turning them from air springs into fluid displacers. Why not do this, and then connect them to pressure accumulators, like those used in boat freshwater supply systems? These accumulators comprise a high pressure plastic cylinder, internally divided by a rubber membrane. At one end of the container there’s a normal Schrader air valve (like a car tube) through which air can be added. The other end of the accumulator connects to the water supply system. In a boat water supply system the internal rubber diaphragm deflects, maintaining pressure in the system and so requiring the electric pump to operate less frequently. The accumulator also damps-out pulsing. These accumulators are relatively light (about 400g each for the Shurflow units I used) and cost around AUD$100 each. 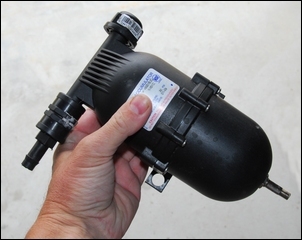 If the airbags pumped water through a restriction, their action would be damped. The air pressure on the other side of the rubber diaphragm would provide the springing mechanism. I filled the front airbags with water, and connected them to a single accumulator. (This also interconnected the front suspension units.) However, the suspension was then rock hard – at 4mm in diameter, the standard airlines were too small to pass the required fluid volume. On the road the result was OK – but not fantastic. I experimented with differing valves in the water lines (trying to get stiffer rebound than bump damping) but the results simply weren’t great. 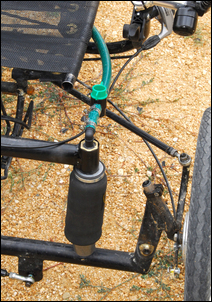 It was also hard to get the air out of the ‘water’ side of the system, and making any suspension changes required water filling, bleeding, air pressurising – it was all getting too complex, especially for a touring trike where repairs might need to be made on the side of the road. It was then suggested to me that I should try the system without the accumulator and its internal rubber diaphragm – using instead just a plastic soft-drink bottle plumbed straight to the airbag. Without the presence of an internal rubber diaphragm, that would allow water and air to mix – but would that matter? My advisor – a guru in the alternative transport world, Bob Stuart – also suggested he’d previously run normal carbonated soft drink bottles at pressures of up to 140 psi! 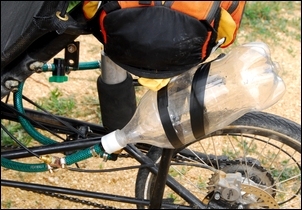 I made up some fittings and connected one suspension end to the soft drink bottle – a short test ride later and I knew this approach would be successful. The ride quality? It was a marvellous ‘fluid-like-flow’, not coincidentally, rather like a Citroen car. I’d run some in-line plastic taps in the displacer-to-accumulator lines (allowing bump and rebound damping to be simultaneously altered) and with these taps open, the damping was quite soft. But start shutting them down and the damping rapidly firmed. By placing the soft drink bottle above the level of the airbag, water stayed in airbag, squirting into the bottle only on big suspension deflections. The water then readily drained back into the airbag – the air stayed at the top of the system, so the water always passed through the taps (thus being variably restricted in flow) and so reliably creating the damping force. And the soft drink bottle system allowed some other very important ideas to be explored. Let’s take a look. In Part 5 of this series (see Chalky, Part 5) I said that with the damper then being used (the ex-R1 Suzuki design) the rear suspension was limited to 180mm travel. 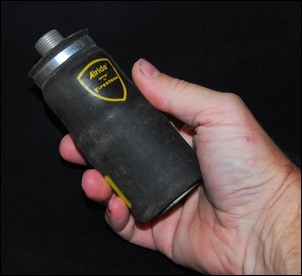 With damping ‘built into’ the airbag movement, this grew to 220mm – a gain of about 20 per cent. 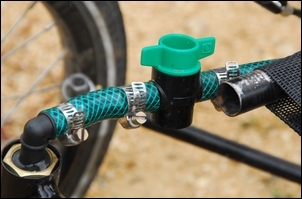 Bump/rebound damping stiffness – by altering the sizes of the orifices through which the water is displaced, adjustable individually for each of the three wheels. Roll damping stiffness - by again altering the sizes of the orifices through which the water is displaced, adjustable for the two front wheels. Said quickly, these factors don’t look all that significant - but they’re incredibly important! Let’s start off by looking at just one aspect of ride quality - the idea of reducing pitch accelerations. High pitch accelerations are best exemplified by the front/rear jerk of the occupant’s head over bumps – this is very uncomfortable. To reduce pitch accelerations, the ratio of front to rear spring softness must be correct. That sounds easy to achieve, but it isn’t. To see what the problem is, we’ll first examine how the front and rear springing systems work on the trike. On my trike the rear spring does not move the same distance up and down and as the rear wheel. In fact, through leverage of the rear suspension arm, the spring actually moves only half as far as the rear wheel. On the other hand, on two-wheel bumps, the front springs move a similar distance up and down to the front wheels. This means that when using the airbags conventionally (ie filled with air! ), the wheel rates (the stiffness of the suspension measured at the wheels) tends to be softer at the back than the front. To reduce pitch accelerations, the front suspension in a vehicle should always be softer than the rear. This is so the front natural frequency is less than the rear. As a result, when the vehicle (at a given speed) passes over a bump, the slower front oscillations soon match the rear oscillations. So instead of pitching, the whole machine then moves up and down relatively horizontally – what some people call ‘heave’. Heave is much preferred to pitching. 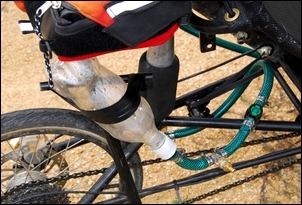 On my trike, using just the airbags, I could never achieve this – primarily because as stated, the front airbags work at 1:1 motion ratio for two-wheel bumps and the rear airbag works at 0.5:1. The result was that, with identical airbags used on all three wheels, the rear suspension was always softer than the front – the reverse of what the textbooks say is required. But with the ‘soft drink bottle system’ I can alter the spring rate by simply changing how much how much air is in the system! By varying the size of the soft drink bottle (and/or by altering the water volume within it) I can have a stiff spring, a soft spring, and in-between spring – in fact, any spring rate I like. In fact, there’s nothing to stop the use of a small bottle for the rear suspension and a much larger bottle for the front suspension. The result? A softer front than rear spring rate, potentially resulting in lower pitch accelerations. Another advantage of the system is that the damping of the three wheels can be changed individually. As described in Part 7 of this series (see Chalky, Part 7), I’d disliked the trike’s lack of roll stiffness/damping, and furthermore, with really violent pedalling, the front suspension could develop an oscillatory bounce. But by setting the front damping taps just-so, I can dial-out this bounce. Being able to adjust roll damping stiffness also means I can now interconnect the front wheel airbags (actually now ‘fluid displacers’). This means that the springs provide no roll stiffness (that’s the sole domain of the leading arm torsion bar – see Chalky, Part 3) but the benefits are some self-levelling over one-wheel front bumps, and a softer single wheel spring rate. Another advantage of the individual damping adjustment is that when riding down a bitumen road with potholes on the broken verge but a good surface elsewhere (something very common around here! ), I can set one front wheel for firm damping and the other for soft, so absorbing the potholes while still suppressing pedal bob. And of course, when going fast on a good surface, the suspension can be stiffened by user-adjustment of the damping, giving clearly better turn-in response and requiring less pedal energy. 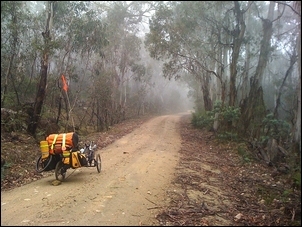 The load that the trike is carrying can vary by up to 50 per cent. With the new system, the ride height can be correctly maintained (individually for both the front and rear) and the damping stiffness then rapidly adjusted to match the new spring rates. It’s time now to do a bunch of further testing. Will the water get aerated, so changing its spring or damping characteristics? Will the trike cope with variable surfaces – corrugations, drop-offs, pot-holes, coarse surfaces – or will an Achilles heel be revealed? I don’t intend keeping the soft drink bottles long term (perhaps stainless steel drink bottles instead?) but will the light-weight plastic designs actually cope with the variable pressures? At least now, after lots of experimentation, I have a system that can again be thoroughly tested.